That the launch of the 2012 Olympic mascots would cause controversy was about as much of a given as a traffic jam in inner city London during rush hour. The 2012 logo went down like Peter Kay jumping off a diving board – it looked ridiculous, hit the bottom hard, but produced a lot of laughs. So it’s no surprise that, when faced with the tough audience that is the British media, the mascots were bound to disappoint too. I must admit, I was initially baffled. Having expected a cute, fluffy, disney-esque smiling character, we were instead greeted by a pair of one-eyed, chrome-plated beings who looked like they were geared up to go on an all-night rave. It looked like the result of something that had been designed by a committee. But when I watched the accompanying video on the London 2012 website, it made a bit more sense of the characters. I remember being gobsmacked by the London 2012 logo a few years ago but, like a rash, it has grown on me and I now kind of like it – it is different, instantly recognisable, and the brand has been carried through really well across all London 2012 media platforms. Think of the country’s national animal. Make a cute, fluffy version of said animal. Have a competition to name the mascot (which invariably results in the most obvious moniker – usually the name of the animal with an “o” or a “y” added to the end). And there we have a mascot! Whoopidoo. In all honesty, the importance of the mascots is pretty minimal. The Beijing Games happened just two years ago, and the lasting impression of that Olympics is not of the multicoloured panda characters, but of the fantastic achievements of Usain Bolt, Michael Phelps, and all the other stories that emerged from those Games. London 2012 could have played it safe by creating a lion mascot, or a bulldog. But how predictable, boring and outdated would that be? 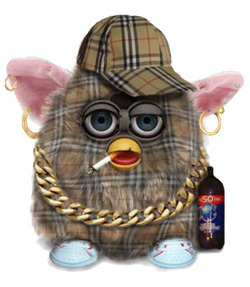 Or, of course, they could have gone down the more representative route by having a chav-inspired mascot to represent the British youth of today (see image, right). But again, it wouldn’t require much creative thought to come to that conclusion. Maybe it’s because I’m a graphic designer that I feel myself siding with the more conceptual approach. Wenlock and Mandeville, as the 2012 mascots are called, are far from the most hideous mascots I’ve seen in recent years. So long as they put a smile on kids’ faces (which, let’s face it, is their real audience), then they will have earned their stamp of approval. But the real proof of the pudding will be during the Games itself. The biggest talking points of last year’s IAAF World Championships in Berlin were the record-breaking feats of Usain Bolt, and the on-track exploits of mascot Berlino the bear. Before the championships got underway, no one took any notice of Berlino. The Local Organising Committee went through the motions, which pretty much mirrored the process I outlined above – the name “Berlino” (in case you hadn’t noticed, that’s Berlin with an “o” on the end) was, unbelievably, selected as the winning entry in a ‘name-the-mascot’ competition. They had a press conference to launch the mascot; released the images to the press; it ticked all the mascot boxes (cute? yes; animal? yes; uninspiring name? yes), and that was that. But it was when the championships got underway that Berlino really came to life – quite literally. He out-sprinted Usain Bolt, got spun upside-down by discus champion Robert Harting, and (my personal favourite) ran into a hurdles shuttle while carrying 400m hurdles champion Melaine Walker on his back. Berlino was an instant hit and, thanks to the power of YouTube, became a worldwide phenomenon. Put simply, he has gone down in mascot history as the greatest of his kind. More significantly, Berlino showed that it’s not what the mascot looks like that is important – it’s more about what is done with the mascot and who is controlling it that will really be the making or breaking of Wenlock and Mandeville. If that means that London 2012 need to employ the man behind the Berlino costume to dress up as these steelwork off-casts, then so be it. 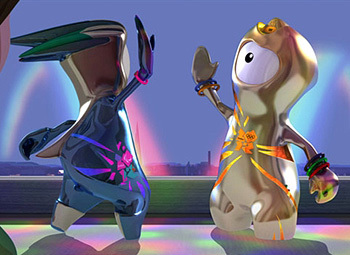 The London 2012 mascots already have a head start on Berlino – their launch has caused much more of a media frenzy than Berlino did, and people are already talking about them. Love them or loathe them, perhaps it is best to wait until the 2012 Games begin to pass the final judgement on Wenlock and Mandeville. Like the 2012 logo did with me, the mascots might just grow on you. As always Jon food for thought. I shall TRY and remain open minded on the mascots…not that my opinion means anything. I am definitely not in the demographics they are trying to appeal to. I had not seen the Berlino-Walker incident before-too funny!